Taper madness is truly setting in. I have far more time on my hands than I know what to do with. Every little twinge or niggle fills me with fear that perhaps I’m falling apart. Am I getting enough sleep? Going too hard? Too easy? Have I run enough lately? Was that massage too deep? Am I eating too much? The questions are endless as is the time to mull them over it seems. On the plus (maybe) I have rediscovered crosswords and made big headway in completing my current book of them. Yes, it is an exciting and glamourous life I lead. However if crosswords were all that was going on I don’t think I’d bother to write a blog post. Instead I’m going to put aside all the niggles and talk about why Ironman Western Australia is a race everyone should fit in their schedule. I admit that for most of the world it’s a bit out of the way, even for Australians it’s a fair way to go. However my experiences this year in the lead up make me feel it’s worth the effort. I’ll concede that arranging a local homestay, getting here over 2 weeks early and getting involved with the local club makes all the difference. If you’re coming from overseas and you get in touch they’re really accommodating and go out of their way to welcome you. The past week I’ve biked, swum and ran with the locals and of course joined in the coffees that happen afterwards. I’ve been introduced to loads of people a good 50% I can’t remember the names of! I can only apologise, I’ve never been good with names and when you get 10 at a time there’s no chance. I’ve been quite open with my time goals even though, as I commented to someone on the ride today, if things don’t go to plan they’ll be way off. Everyone is very encouraging and likes to hear about someone taking the chance on a year’s training. It’s a real boost on the mental side of the race as I feel I’ll have a lot more backing out there and will probably know people at the aid stations! Outside of the club which is unsurprisingly keen about the event many of the locals love it too. 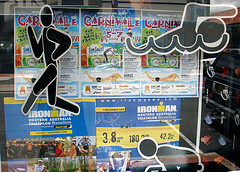 The shops are encouraged to put Ironman decorations up in their windows. New banners are up in the street all for the Ironman. As I was out doing my final long run on the course yesterday a bunch of school kids riding home wished me luck! I have to confess that now more athletes are starting to turn up it’s almost disappointing. Like my secret training spot has suddenly been discovered! Still I’ve really benefited from the local knowledge and support so far and it’s helped make the final taper training more interesting. The real highlight of the Ironman course itself is the swim round the jetty (be very clear it is a jetty, not a pier). Conveniently the jetty is about half the length of an ironman swim, so an out and back works perfectly. From the athlete’s perspective sighting is easy as, just keep the jetty on your right and you’ll be fine. Much as you should be focussing on your swim technique as you swim out and back the shallow bottom is always visible letting you watch the sea life swim below. This morning I swam round the jetty with another Russ, the conditions were near perfect, ideal for race day. One warning though, last Friday I swam with the club and the sea was pretty choppy and that’s certainly happened on race day before. Then it’s a battle to get out to the end of the jetty, though the return isn’t so bad. The occasional little stinger jellyfish is a slight pain, but fortunately no sharks so far! Most of the club rides don’t follow the Ironman course, instead going out on Sues Road to one of the local ‘hills’. You’ll not improve much as a climber here, choices are limited. For the race it doesn’t matter, it’s pan flat and potentially fast. I say potentially because the winds will really dictate things. Whilst Tuart (don’t pronounce the a too hard… I’m getting lessons from the locals on how to say there things!) Road is sheltered by trees most of the course is quite exposed. Large flat expanses give plenty of room for the winds to build up and if they’re anything like Sunday you’ll be flying one way and grinding the other. Wind aside the only other issue likely to occur on the course is stiffening up from holding the aero position so long. With no undulations you need never move. I’ll concede at 3 dead flat laps it’s not the most exciting of routes, but I think the swim and run make up for this. My final long run was a lap and a half of the run course. It stretches along the beach front for roughly 7Km making for three 14Km loops on race day. As with the bike course it’s flat as again making for potentially fast times. Last year I had a bad run really, this year I’m aiming to set a new Ironman PB! I hope the stomach issues of my training run yesterday weren’t a bad omen! Again it’s exposed so can be a bit windy, I actually felt running into the headwind was tough going yesterday. Once it was behind me it was great, though if the heat is up it won’t be so comfortable. I’m feeling fairly good in my running right now, it’s all about holding form right till the end. The race expo and centre is being set-up at the moment. Tents are being put in place and excitement for the race is definitely building. Athletes are arriving now, I chatted with a couple from Switzerland at the cafe this morning. They thought I might be Swiss as I was wearing an Ironman Switzerland T-Shirt. They’ll be a few more people I know or rather know of and will get to meet in the next week so should be good. I foresee much more time spent indulging in coffees and resisting the cakes (whilst making a mental plan of all the things I’ll let myself eat in my recovery weeks!). Speaking of which I have a cycling magazine I need to read over a coffee on my way to my massage.